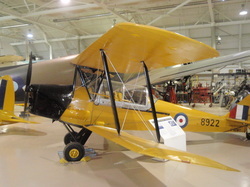 A nice Lysander STOL plane, many of which were built at nearby Malton airport during the Second World war. Oblivious son nearby. Side view of the same, six months later. The original headlights in the landing wheel pants i'm told were almost too much draw for the electrical system to power until a resourceful engineer discovered that a set of 24 volt pick-up truck headlights fit in there just fine. Son agrees and runs away. 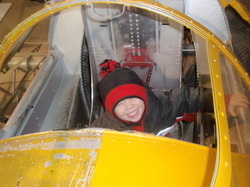 Son enjoying the pilot's seat in a Harvard trainer. 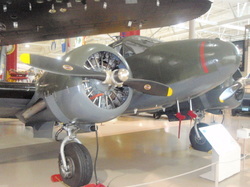 I still have a propellor hub from one of these that crashed in a field by my former home, during a training flight in WW11 -I use it as a doorstop but if you're a Harvard owner looking for one, let me know. 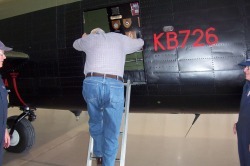 So after recounting his memories to the staff at the HAM of seeing the Lancs fly over his home in Holland during the war, the resident curators couldn't resist giving uncle Jan an up close inspection of one of the few remaining during a visit last year..it made his day. 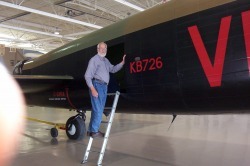 Not a big fan of the new paint scheme- it looked better without the P-40 touch. As one of only two flying Lancasters in the world (I think about 500 were built in Malton alone) the Mynarski bomber spends a fair bit of time being maintained in the winter so it can fly airshows in the summer. 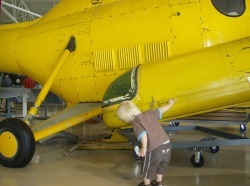 The jury is still out for me if this is a great idea when there are so few examples of this plane left to even look at. 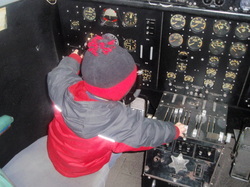 Even so, I attended the inaugural flight when the rebuild was first completed and enjoyed it thoroughly. 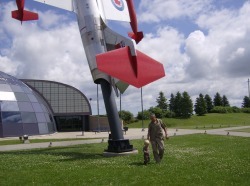 It's the day after Christmas 2010 and my wife is running a road race in Hamilton so Erik and I have returned to the Hamilton Warplane museum to kill some time and add some warranted photos to my Hamilton page. I thought we'd start with a reprise of him in his favourite trainer. 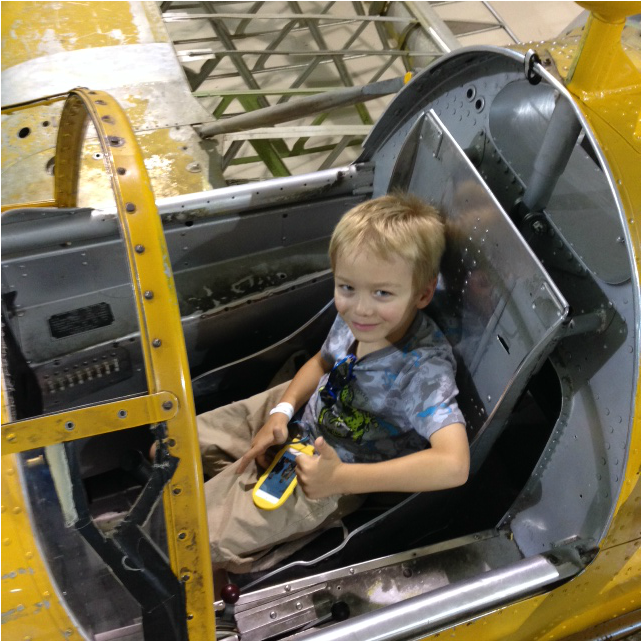 Having quickly met his dad's expectations in the Harvard, I decided Erik was ready for his multi engine endorsement. 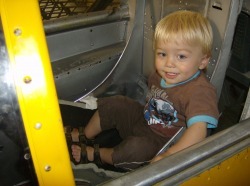 Here, Erik executes a successful pull-up from his first bombing run with dad in copilot's chair. Canadian demonstration team F-86 Sabre jet. 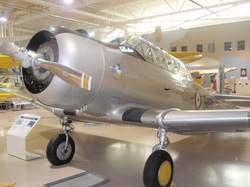 Made famous by the very cool, Jimmy Doolittle. Vampire jets were Canada's first fighter jets and were retired in the late 1950's. 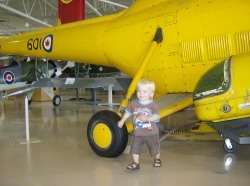 There was a squadron based at Downsview. Made famous of course by the Snowbirds. They used to fly these out of Centralia (among other places) during WW11, practising bombing runs over nearby Lake Huron. 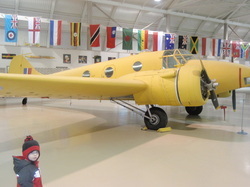 One of two flying Lancs in the background...made in Canada at the Malton airport during the 1940's. 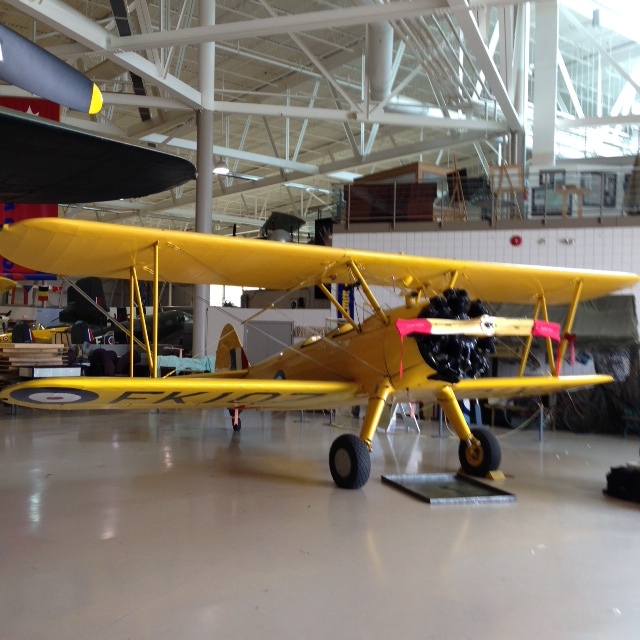 This is the same jet that's mounted in front of the museum only with a more colourful paint scheme. I always thought this was a cool looking jet. 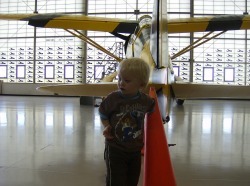 This jet was probably stationed at one time at nearby Downsview airport. This one has spent a little too much time outside.